This is the spawn. Absolutley nothing to say, its just fine and looks good. Good job! At the end of the tunnel, this adjoint area looks weird/unpolished, i think it can be improved, maybe make it a bit smoother. This is the #1 issue of random unattended jump/backflips most of the time, especially on high speed. The straight track just ahead of the track missing the forcefields on both sides,wich makes you go thru the rocks. please fix. After reaching the first jump, you should be able to choose your path between the ramps but.....heres the problem: in order to reach the lower area, you have to slow down too much, reaching something like 150-250km/h, wich it will never gonna happen until you really, really want to use your breaks on a straight line during a race. My suggestion is to place the lower area to the left, paraller to the upper one, giving you the ability to choose quickly wich path youre about to take. if you take the left down one, you will waste more time by doing a larger turn, but it will compensate with the upcoming series of speedpads wich should give a considerable valuable option. This is an intresting one. I might suggest to improve this second landing jump area with another floor under the main trackone. Adding another floor just like the first earlier jump. About this alternate vertical path.....its way too risky to consider pick this one, especially if you wanna take the path and return back. It work 15-20% of the time, but that because most probably the angle is not smooth enought, a smoother curve entrance/exit of this section might solve the issue, making the decision to pick this path more valuable since you will have more "GRIP" during the coming in/coming out phase. Last edited by Costa on Thu Jul 06, 2017 1:18 pm, edited 1 time in total. no need for those extra ramps!! just let us drive BELOW THE EXISTING ONES!! Costa wrote: After reaching the first jump, you should be able to choose your path between the ramps but.....heres the problem: in order to reach the lower area, you have to slow down too much, reaching something like 150-250km/h, wich it will never gonna happen until you really, really want to use your breaks on a straight line during a race. I thought so too, until just now. 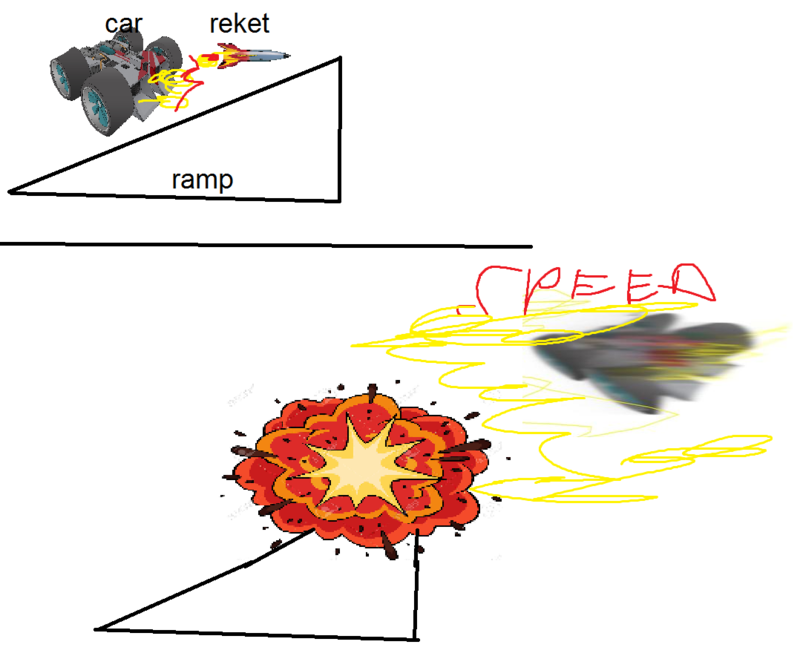 It turns out, if you're going very fast, your car will lift-off at the spot where the track starts going down - this usually happens anyway, messing up your jump preparation - BUT, if you're going REALLY fast, your car won't touch the track after it lifts off.. until it lands right in that lower area with the booster pads! In case anybody is interested, I was driving a Terra Dominator when it happened. I will try to replicate it and record it on video, but no promises. I did it again! It seems to depend not only on your speed but also on your trajectory, you have to sort of keep to right side of the track. Not quite as smooth as the first time I did it, but you get the idea. I don't know how to edit videos recorded with GeForce Experience (yet), so jump to 2:20 for the jump, hehe. Arrright folks...its time for a revision about my suggestions after the changes made, because why not? First of all, THANK you for apply a few changes to this track, now looks overall quite better, but still needs just a few improvments to make it on a good level of joy. How that looks? i think its worth it a try. For the final jump, i noticed one thing: quite often, while jump, cars tend to land on the very left zone next to the start/finish line , crashing into the finish line, with full jump, can we move the jumping ramp a little bit to the right to compensate that? Ps. Whats with the fog right next to the final ramp? can it be reduced? it seems too visible to me, maybe add more distace for that? Last edited by Costa on Thu Aug 03, 2017 5:18 pm, edited 3 times in total. TheOnLY wrote: I agree with the changes proposed in last two images.I don't like that route at all. For the 3rd image: I really dont like the artificial limitation of the track by blue barriers and the optimal line is much closer to the left than the blue barriers are. I think all those changes are not needed, track is good as it is currently. - The second ramp will split again even more the players, that's not a good idea. The players are already separated by these two different routes, which is enough. - The big open area idea is to make a 180 degree drift there, I don't like the blue shields as I think it will limit the players movement and how you want to enter that turn to initiate a drift, there's really no need to guide the players there. Free open space adds variety, there is not many in the game. I think the spacelab/containers idea is good though. - I'm really a fan of the forced jumps, the game needs even more. it's quite hard to take it correctly so it adds risk to that path. it forces you to slowdown to align carefully. The big turn around you're suggesting will make this route waaay too slow. It is suppose to be a shortcut. - The final jump is meant to be taken completely on the far right. You must probably jump from the left of the vertical platform, that's why you end up in the wrong landing zone. I've never landed there, and can land on the main route very consistently so you must be doing something wrong. Agro is a work in progress and your feedback is taken into consideration when adjusting it. Stuff like the path on the side of the road after the big loop not allowing clean re-entry to the main road is pretty important and should be changed. Adding alternate paths for effectively the same stretch of road could be a waste of development time. Does it actually benefit gameplay or does it just look cool? If we add too many alternate paths (that block sight on other routes), racers will be split up constantly, so they have to provide different experiences that are just as exciting as the main road to actually be worth taking. Adding a second road beneath the main path to circumvent the split right after the big loop makes for a clustered design that diminishes the main road. Slapping the big loop, +main road with split design, +2nd road underneath with potentially another obstacle all together means too much is happening in that small space. Adding obstacles to the big square area you think is wasted space is something I think most veteran racers can agree with, but it'll also frustrate a lot of people, so a balance has to be found. Or more of a solution in the form of adding obstacles that slow racers down but don't punish too harshly when failed, I guess. Skill levels vary greatly and some people don't want to hear this, but GRIP has to be playable for more than just the top 20% of gamers. I can't really tell what'll happen to the big square area yet, but know we definitely read and keep in mind your suggestions. The big square would function well as a spaceship docking bay. This would add eye candy to the area and to give function to its form. I don’t mean that space craft would land on the pad but that they would come to rest hovering beside, around and over it... perhaps tethered to it (re fuelling or something). I understand this might take a bit of art work but it won’t affect the flow of the track… only function as dressing. There may not be a need for obstacles to be added to the square itself though some could certainly be dotted around with consideration to the above mentioned aesthetic i.e. maybe cargo containers and fuel lines. Perhaps power up placement on this area could encourage racers to stray from the standard (or fastest) racing line and offer up some risk/reward gameplay. That sounds pretty damn interesting, playabot. Maybe a docking station for the various craft keeping parts of the Acrophobia road up? - Ability to pick items by using another path. When several player are playing, its quite difficult pick items if if youre last and the track have only one flow. think about it. Speed bowl is a perfect example of mediocre. - Excellent assassin evading menouvre/overall good method to escape if someone is chasing you. I recommends implement these changes and see what happens, we are testing and im confident in what ive wrote, i played a lot this track. its a sad thing they gonna remove the altenate path at the end, it was an excellent example of my first idea. One last thing, the "alternative" paths doesnt means cars will be separated, sometime car pick the same path, and most of these separate path doesnt take longer than a couple of seconds, like 4 - 5 seconds max. Broscar wrote: That sounds pretty damn interesting, playabot. Maybe a docking station for the various craft keeping parts of the Acrophobia road up? Yeah man, that could work I like things like that... ading elements that ad to the story or history of a location. Less walls and artifical boundaries. I understand that walls and boundaries play a part in keeping newbies on the track but I think that there is another way to easily educate players about some of the hazards on track befor they come across them. I might write that up on another subject though. Broscar wrote: adding elements that ad to the story or history of a location. Less walls and artifical boundaries. Agreed. There's a clear lack of more organic ones (walls and boundaries).